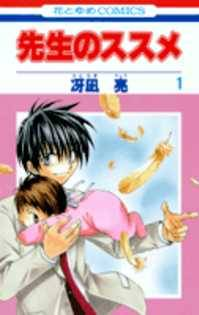 Sensei no Susume is an on-going manga created by Ryou Saenagi. God has been dead for some time, and the angels in heaven have decided it's time to find a replacement. The four chosen candidates have one year to prove their suitability for the position, while also having a mission to fulfill. Each of them is given a being in the form of a 'baby'. It has no emotions, thoughts, or memories of its own, and the angels must raise their 'baby' into a being 'as close to human as possible' within the time given. They are allowed to reveal their true identity to one human being on Earth. Rain is one of the candidates for the position, though a rather reluctant one. He tests Shirou Natsume, a highschool student that dreams of becoming a teacher one day, and finds him a good choice to reveal himself to. Now Shirou must raise this 'baby' with Rain. Armor-Piercing Question: Shirou tries to pull one on Rain over his attitude, only for Rain to retort with one himself about how humanity needing its problems solved by God led to his death. Shouldn't you humans be able to help yourselves? Beleaguered Bureaucrat: God was one, when he tried to manage humanity. Deadpan Snarker: Shirou and Rain snark at each other from time to time. Empty Shell: The 'baby' the angels are given to take care of. They have no emotions or thoughts of their own, and everything needs to be taught to them. God Is Dead: Died quite some time ago. From overworking. Humans Are Bastards: Rain says that, had God not kept interferring with humans, they would have devolved back to their ways of destroying things and killing each other. "It" Is Dehumanizing: Shirou is appalled that Rain and a demon keep referring to the 'baby' as It or Thing, despite being told that it really isn't a human being itself. It merely is something that has the shape of a human being. Longhaired Pretty Boy: Rain is a prime example. Several of the other angels sport long hair, too. Meaningful Name: Shirou names the 'baby' Moe, which he explains to Rain as meaning 'a sprout breaking through'. Our Angels Are Different: Angels with Rain's job carry guns. Parental Abandonment: Shirou's parents are workaholics and never really planned on having children. They were parents to Shirou for some time, but when he was in elementary school, his parents chose to go work overseas as they though that Shirou wouldn't 'need them as parents' anymore. Raised by Grandparents: Shirou has lived with his grandparents since elementary school, after his parents decided to work overseas. Resigned to the Call: Rain would prefer to not be in the running for the position of God, but he will join the test. Unsettling Gender Reveal: Moe turns out to be a boy, which Shirou didn't notice until Rain changed the diaper. He thought Moe was a girl because Rain put Moe into pink clothes.